In 1790, two Western ships, Simon Metcalf (captaining the Eleanora) and his son Thomas Metcalf (captaining the Fair American) were trading in Hawaiian waters. The Eleanora arrived in the islands first; after a brief confrontation with local chief Kameʻeiamoku in Kohala, she sailed to the neighboring island of Maui to trade along the coast. Kame‘eiamoku vowed revenge on whatever ship next came his way. By coincidence, the Fair American was the next ship to visit the territory of chief Kameʻeiamoku, who was eager for revenge. Isaac Davis was a crew member of the Fair American. Young was captured and Metcalf, unaware, was puzzled why Young did not return. Metcalf waited two days for Young to return, firing guns in hope that the sound would guide Young back and sending a letter to foreigners ashore. Kamehameha gave the name ‘Lopaka’ to the powerful pū kuniahi (cannon) that was captured from the British ship Fair American. The famous cannon, Lopaka, was dragged and set up at a place called Kawelowelo, and from there it was fired into the ‘Iao Valley, and turned to fire at the cliffs where the Maui people were attempting to flee. The thundering sound of the Lopaka cannon caused absolute terror amongst the Maui warriors, and some of them met their death by the weapons of the foreigners. They were slaughtered below the pali. While the Lopaka cannon was being fired by John Young, Maui warriors gathered together some men and sprang to seize the Lopaka cannon. That cannon fell into the hands of Keoua’s men (for a time,) and John Young ran for his life arriving before Isaac Davis at the place now called Honoka‘a. At this place a very hot battle was fought between the two sides. If John Young had not run, he would have died at the hands of Ka‘ie‘iea, Keoua’s fearless warrior. (Desha) But the damage had been done. Had they fought face-to-face and hand-to-hand, as the custom was, they would have been equally matched. But the defensive was drawn up in a narrow pass in ʻIao, and the offensive advanced. Because of their knowledge of European warfare, Young and Davis are said to have trained Kamehameha and his men in the use of muskets and cannons. In addition, both Young and Davis fought alongside Kamehameha in his many battles. Davis became a respected translator and military advisor for Kamehameha. Davis brought western military knowledge to Hawai‘i and played a big role during Hawaii’s first contacts with the European powers. His skill in gunnery, as well as Lopaka from the Fair American, helped Kamehameha win many battles. The cannon and other fire arms – and people who knew how to effectively use them – were pivotal factors in the outcomes of future battles after “contact.” Here are a few who helped. John Young, a boatswain on the British fur trading vessel, Eleanora, was stranded on the Island of Hawai‘i in 1790. Kamehameha brought Young to Kawaihae, where he was building the massive temple, Puʻukoholā Heiau. Because of his knowledge of European warfare, Young is said to have trained Kamehameha and his men in the use of muskets and cannons. Young was instrumental in building fortifications throughout the Islands, which included the conversion of Mailekini Heiau (below Pu‘ukoholā Heiau) into a fort, which he armed with as many as 21 ship cannons. Young also served as a negotiator for the king, securing various trade and political agreements with many of the foreigners that visited the Islands. Kahekili and his half-brother Kāʻeo sailed for Hawai’i, carrying with them Mare Amara (from France or Italy) and a special group of fighting men called the pahupu. Once more foreign weapons worked devastation on the old methods of waging war. Mare Amara picked off an enemy chief where he stood, feather-cloaked, directing his warriors with sweeping gestures. Later, Captain Brown had Mare Amara aboard advising his crew in a conﬂict. Amara was later executed; he was considered a turncoat. Reportedly, he was burned alive on the deck of the boat in a large pan of his own gunpowder. These are only a few of the prominent foreigners who sided with Hawaiians during the post-contact era – there were others. In the end, Kamehameha had more weapons on his side. With these powerful new weapons and associated war strategy, Kamehameha eventually brought all of the Hawaiian Islands under his rule. 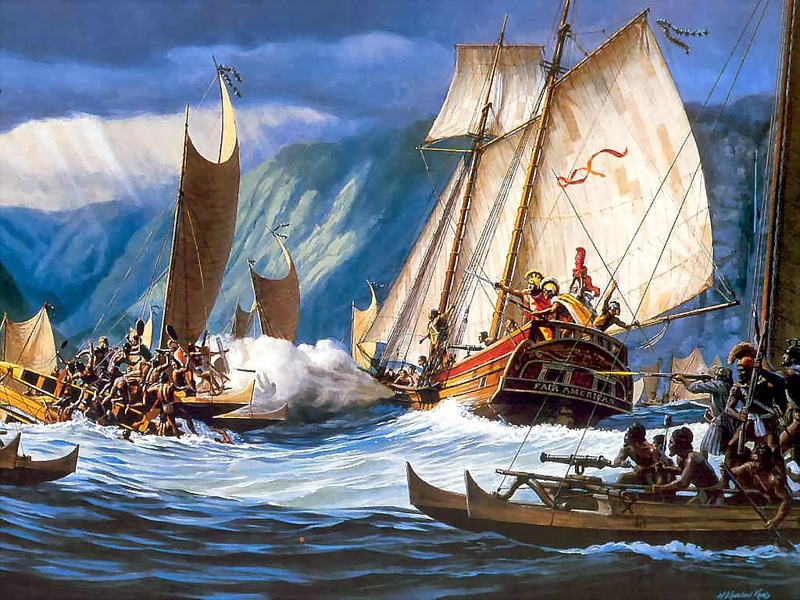 The image shows Herb Kane’s depiction of Kepuwahaʻulaʻula, the battle of the red-mouthed gun, where both sides had foreign guns and gunners.